This terminally obscure release from California has a gentle, almost sweet soul feel, but the vocal has a fine smoky tone and strong emotional force, and the horns give some weight to the arrangement. You gotta love the tenor sax and the double tracked sections of the song. 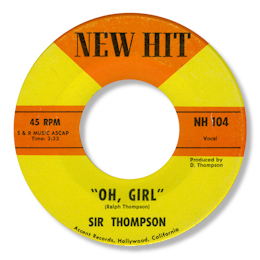 Judging by the writer credits is Sir Thompson really Ralph Thompson, and the producer Darlene Thompson?